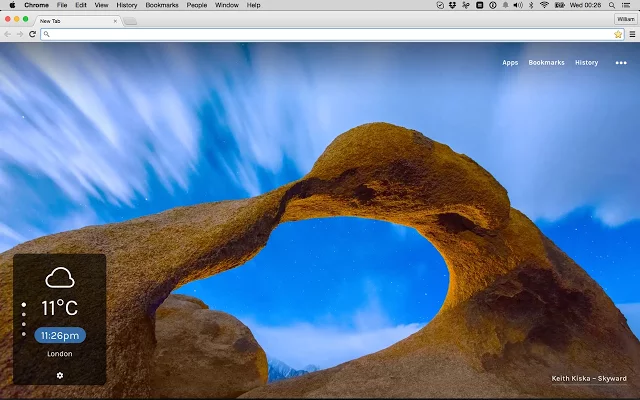 There’s now a whole library of Chrome extensions which aim to enhance your "new tab" page, typically by importing new wallpaper from sources like Flickr and Shutterstock. Delight goes a step further, replacing the usual static images with gorgeous time-lapse videos. Our first new tab displayed a spinning night sky view. The next, a view from a mountainside, as cloud rushes like water across the valley below. A dark desert floor, the sun setting behind distant hills. The camera pans gently around most scenes, giving a mild 3D effect. Even scene runs for around ten seconds before repeating. Resource use didn’t seem too bad -- the videos are about 3 to 4MB in size, not a big deal in Chrome terms -- and it barely added a fraction of a percentage point CPU usage to our system. Right-clicking the screen displays options to disable looping, save the video locally or copy the video URL to the clipboard. Delight isn’t just about the visuals. There are also links to open your most visited sites, your bookmarks or apps, and there’s a bonus weather tool which displays the current conditions in your chosen cities. Delight doesn’t offer many scenes -- we managed five or six "new tab" videos before we got the first repeat -- so the extension isn’t going to give you a fraction of the variety of the image-based competition. But what you get looks good to us, and overall it’s an appealing alternative to the usual static wallpaper. Delight is available for Google Chrome.